Niagara Hospice, a 501(c)(3) nonprofit organization serving all of Niagara County, began its grassroots movement in 1980 when the Reverend Robert Cook of the Town of Tonawanda gathered a group of concerned citizens, including co-founder and current Niagara Hospice board member Patricia Evans, to discuss the feasibility of developing a hospice program for Niagara County. As a result of that first meeting the first board of directors was formed in 1984 and the organization became incorporated as an Educational Association. In 1986, a Certificate of Need was presented to the New York State Department of Health by then board president Patricia Evans and in June 1988, Niagara Hospice, Inc. was licensed to serve its first home care patients. Since then, Niagara Hospice has been privileged to serve more than 25,000 Niagara County residents and their families.Thanks to a dedicated and hard-working staff, volunteer corps and partners in care, Niagara Hospice has evolved to meet the increasing needs of the seriously ill and their families. Niagara Hospice is the only hospice in Western New York accredited by the Accreditation Commission for Health Care (ACHC) and the only hospice to have its own ambulette. Hospice is a way of caring for patients with end-of-life illnesses and supporting their family and loved ones through the illness and dying process. At Niagara Hospice, we believe every day is a gift and we value quality of life for each and every patient. As the only hospice provider in Niagara County, our staff and volunteers take pride in their compassionate service to others. Just one call to Niagara Hospice provides loved ones the physical, emotional, psychosocial, spiritual and bereavement care they need. Niagara Hospice's dedication to providing the highest level of care is recognized by the Accreditation Commission for Health Care (ACHC). The ACHC has awarded Niagara Hospice with its accreditation for hospice care for demonstrating a commitment to providing quality care and services to consumers through compliance with ACHC's nationally recognized standards for accreditation. 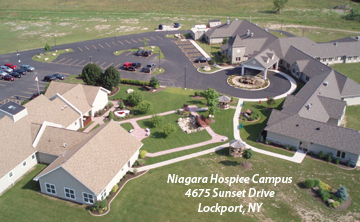 Niagara Hospice is a not-for-profit charitable 501(c)(3) organization recognized by both New York State and the Internal Revenue Service. Hospice gives hope for comfort when a cure is no longer feasible; hope that a secure, familiar care setting can be enjoyed; hope for personal dignity and freedom from unwanted procedures. Additionally, Hospice gives hope that the family will be nurtured and supported, even after the death of their loved one. Many of our families have told us that choosing Hospice allowed them more time to be together. "There are no words that I can say to thank each and everyone at Hospice. You gave me not only peace of mind, you gave my heart peace. I was able to be a daughter to my father and not a caregiver before his death. Thank you from the bottom of my heart." Every family's situation is unique. You do not have to face this illness alone - we are only a phone call away. When medical science can't add more days to life, Hospice adds more life to every day. Call today at 716-HOSPICE or (716) 439-4417.